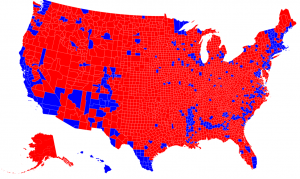 Bill gives presidential voting power to areas in blue. This may be our last chance to protect the Constitution from the Colorado Democrats, says GOP Party Chair Jeff Hayes. Unfortunately for those of us fiercely protective of our right to vote for the president of these here United States, Hayes is not overreacting. The bill to rob us of the Electoral College method for equal representation in the national vote faces sabotage in the Democratic-controlled House today. Hayes is encouraging everyone who can get off work for an hour or more to show up at the 1:30 p.m. hearing today in the Capitol, room 271, to show their opposition to the plot. Here’s what happens if Colorado Democrats win and we are added to the national compact of larger, more populated states: A presidential candidate who wins the popular vote which always comes from hugely populated areas, that candidate would automatically get all of the electoral votes in the new compact. That leaves fly-over country, including Colorado, without a voice in the election. If you can’t get to today’s hearing, click on this link to send an email to all of the House committee members telling them how you feel about the popular vote compact.